Your Next Stamp First Birthday Bash Blog Hop!!! Today is a very special day as Your Next Stamp is celebrating its very 1st birthday with a Birthday Blog Hop!!! The hop will run today through Wednesday, August 11th at midnight! The YNS Starlets are being joined by some fabulous friends for this hop, and together we are showcasing some fantastic new release stamps as well as some old favorites! These new stamps are available to buy today from Your Next Stamp! We have not one but TWO grand prizes for you to win!!! Two lucky winners will be drawn at random to each receive a $25 gift certificate to spend on YNS stamps! WOW! As the prize is so fantastic, we are going to make you work a little to enter, LOL! Each Starlet and Guest Starlet have a letter hiding in their blog post. All you need to do is gather these letters, rearrange them to form a 3-word phrase, and then email this phrase to Karen. All correct entries will be entered into the grand prize draw. So make sure you hop around every blog and remember to leave a comment at every stop too. So now it's time for you to hop on over to Nicole's blog for some more cuteness, but don't forget to grab my hidden letter and also leave a comment before you go! Oh my wordies girlie is this too darn cutetabulous! 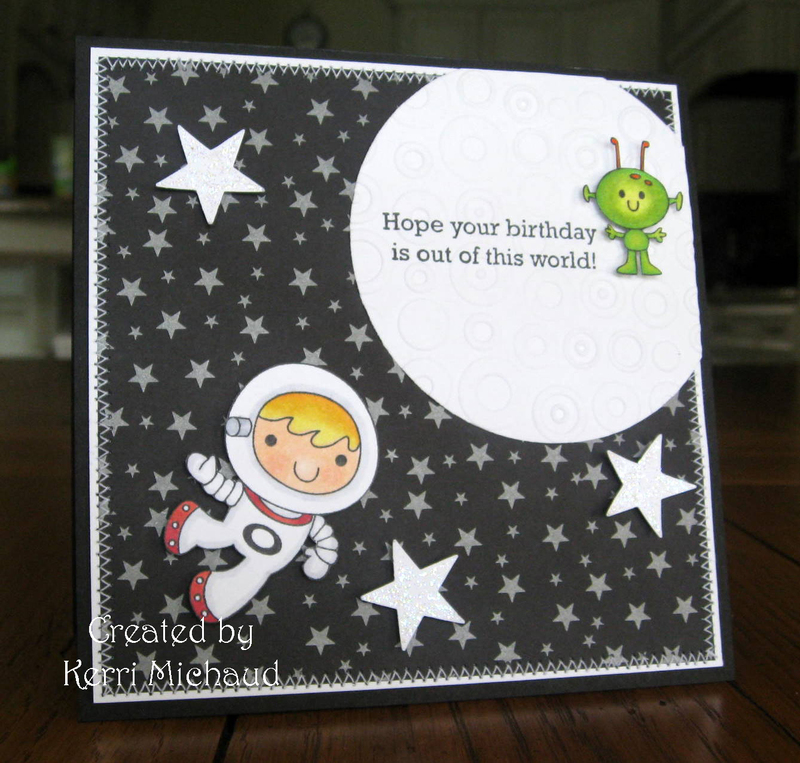 LOVE the way you created this space card and that ALIEN! Wow! My fav! Who knew aliens could be so CUTE! Loving your card sweetie! Great little scene you've created...he looks like he is floating through space! Kerri Space Boy is FABULOUS!! Oh my WORD girlie! How CUTE are these images! What an OUT of this world (lol) Card!!! Hello, I love the sentiment with this image...perfect! Thank you for being on the blog route for us to hop on! That is so stinkin' cute!!! I LOVE it. And I love that you put the sentiment on the moon with the alien!! It makes a great scene. This is so adorbale. I love the moon and that little green martian is ADORABLE!!!! Oh my gosh! Love this card. I think 'Space Boy' is my favorite image! Kerri OOOOOOO WEEEE I love this girl..the paper is fabulous and your design is GREAT!!!!!! What a super sweet image...LOVE HIM!!! Very cool card, Kerri! Love the layout! Cool card, really adore this image. So cute! Too cute! I love the paper and stitching! Great card for a boy or a girl! I love your sweet card colors are awesome.. This is a great card! I really like the star background! Shows off the larger stars and the 'space boy'. Fabulous card! Love the star paper and your moon is perfect! Great card! I love the colours. Super Cute and so funny, wonderful! Cute card! I love the spacey stars. awe. this is CRAZY cute! Love the little space boy-and that you added the little alien. Too cute! Space boy is the cutest set I've seen on the blog hop. Hopping over to buy it. Love that you got some stitching on a boy card.....this is really fun....and the shimmery stars are perfect! can't get enough of this little guy, terrific space scene! What a gorgeous card Kerri!! I so love that fun little space guy and the scene you created. you rock girl! What a fun card! Love the little alien on the moon too! Such an adorable card - TERRIFIC job cutting out that astro boy (tough to do). I like the starry background DP and your great coloring job of the cute little alien.